This website is dedicated primarily to the giant sequoia (Sequoiadendron giganteum), which is also known as the sierra redwood. Our experimentation and observations of the giant sequoias in the wild as well as in the nursery and landscape garden for nearly 30 years has helped to dispel myths with regard to the giant sequoia species. We are happy to share what we have learned. It is our mission to spread this magnificent species around the USA and to the world. The buyer of a landscape tree with an identification number will receive the actual tree that is pictured. 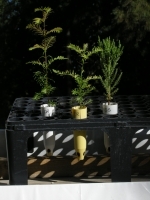 We also have an assortment of giant sequoia bonsai trees along with many species of western conifers to choose from. Check out our gift page where we have gift trees, leaf jewelry and other items that will make great gifts. We make a great attempt to keep the pictures as current as possible. We ship our products year round on Mondays by UPS, FedEx, or USPS Priority mail unless there is a postal holiday. The ship date would then be on Tuesday. We can ship on the Monday of your choosing. 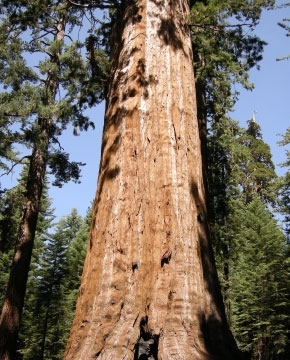 The General Grant Tree has the greatest trunk diameter of any giant sequoia at 40.3 feet. The most commonly asked questions are answered on the FAQ page. If you have further questions or comments, please e-mail us. Giant sequoias (Sequoiadendron giganteum) are the most massive tree species on earth. The genus sequoiadendron can be traced to the Triassic Period of 200 million years ago. 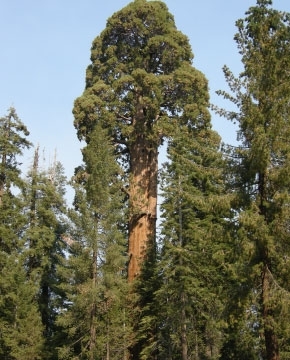 The giganteum is the only surviving member of the sequoiadendron genus. The sequoiadendrons were the dominant trees in North America and Europe from the Jurassic to the Cretaceous. They reigned from 180 to 35 million years ago. The conditions that the giant sequoias of the Sierra Nevada’s found favorable are many. The Sierra Nevada Mountains crest at around 14,000 feet in elevation. The crest runs from northwest to southeast in central California. The eastern slope is very steep and rocky. The western slope declines in elevation more gradually toward the west to the central valley of California.